Deutsche Bank's stock plunged to a record low on news that the Federal Reserve labeled the bank's US business "troubled." The secret and rare designation from the Fed took place about a year ago and forced Deutsche Bank (DB) to dial back its risk taking, The Wall Street Journal reported on Thursday. Deutsche Bank, Germany's biggest bank, has been in turmoil for years. Mounting losses recently led the company to cut more than 7,000 jobs and oust CEO John Cryan. The "troubled condition" label has forced Deutsche Bank to get the Fed's approval for decisions including hiring and firing senior managers, reassigning job duties and making severance payments, the Journal reported. Deutsche Bank's Frankfurt-listed shares tumbled 7% and closed at a record low on Thursday. The previous low was set in September 2016. The company's US-listed shares are on track to close at their lowest level in nearly two years. 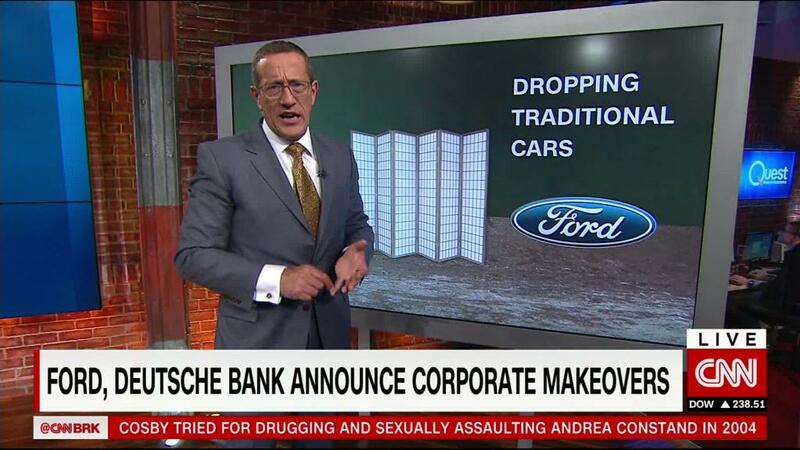 Deutsche Bank declined to comment to CNNMoney about "specific regulatory feedback." However, Deutsche Bank acknowledged in a statement that "our regulators have identified various areas for improvement relating to our control environment and infrastructure." "We are highly focused on addressing identified weaknesses in our US operations," the bank said. The Fed declined to comment. A recent blunder by Deutsche Bank raised questions about the company's internal systems of checks and balances. Deutsche Bank accidentally sent a $35 billion payment in March to an exchange it does business with, a person familiar with the matter told CNNMoney last month. The epic mistake, which Deutsche Bank blamed on an "operational error," was for $5 billion more than Deutsche Bank's entire market value at the time. It's not just the Fed taking notice of Deutsche Bank's problems. Deutsche Bank Trust Company America's, the bank's FDIC-insured subsidiary, has been added to the FDIC's "Problem Banks" list, the Journal reported. Problem banks are deemed by the FDIC to be at risk of failure. The FDIC said it does not comment on open and operating banks. Deutsche Bank said in a statement that its US banking subsidiary has a "very robust balance sheet" and its parent company is "very well capitalized." The red mark for Deutsche Bank's American divisions stands in stark contrast with the robust health of the US banking system. US banks hauled in record profits during the first quarter, with 70% of the nation's lenders growing their bottom lines, according to the FDIC. The FDIC's list of problem banks fell to just 92, the lowest since 2008. Deutsche Bank is under pressure from shareholders to speed up its yearslong turnaround plan. New CEO Christian Sewing is charged with fixing a bank suffered a 79% drop in profits last quarter. Under Sewing, Deutsche Bank is retreating from Wall Street and making cutting its workforce from just over 97,000 to below 90,000.